Weddings or other private parties (somewhere to put a marquee). 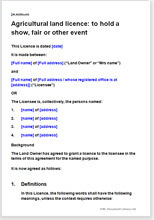 This licence grants permission to occupy land for a specific purpose for a specific, limited amount of time. If the occupation is continual and for more than a short period (say 3 months), then using a lease might be more suitable. However, if the event is recurring but for a short period (such as a car boot sale every Sunday for four months) then this licence should be used.